North America Dental Implants Market size was valued at USD 1,243.8 million in 2017 and is expected to witness 5.3% CAGR from 2018 to 2024. 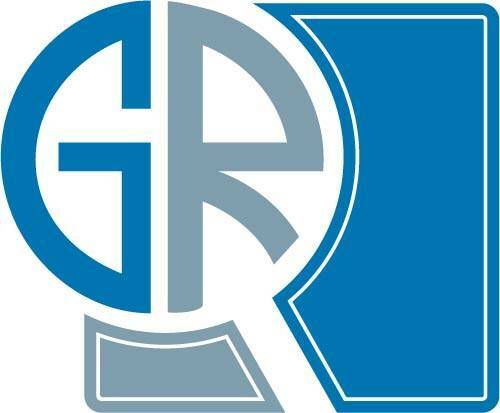 Escalating geriatric population in North America should drive dental implants market market growth in recent years. Elderly population is highly vulnerable to edentulism. Missing tooth and dentures can result into inadequate consumption of food. Hence, dental implants is witnessed as a preferable and effective alternative treatment for tooth loss. Furthermore, increasing incidence of periodontitis, dental cavities and decay in older population will lead to rise in demand for dental implants in forthcoming years. Rising burden of dental disorders coupled with favourable dental insurance policies across North America is estimated to drive dental implants business growth. Dental disorders such as dental caries, tooth decay and gum disorders result into tooth loss. According to Canadian Health Measures Survey, about 2.26 million school days are lost due to certain dental disorders in Canadian population. Also, 62% of Canadian people have private dental insurance coverage. These factors will lead to higher acceptance and adoption of dental implants in the region. Accelerating demand for cosmetic dentistry in U.S. should augment North America dental implants market growth. Implant dentistry is an efficient option for tooth restoration that maintains the facial value of the patient. Thus, dental implants is favored option of cosmetic dentistry. Dental implants offer long-time solution to tooth loss along with enhancement of aesthetic value. Benefits of restoration and cosmetic dentistry is set to increase market size of dental implants in North America over the upcoming period. Tapered dental implants segment contributed share of 85.2% in 2017 and is projected to record high market size throughout the forecast timeframe. Remarkable growth is credited to superior advantages offered over parallel-walled implants. Tapered implants distribute forces in the surrounding bone and creates uniform compaction in adjoining osteotomy walls as compared to parallel walled implants. It condenses soft bone and increases stability. Such benefits over parallel walled implants will lead to increase in segmental size over the upcoming years. Titanium material segment accounted for USD 862.2 million in 2017 and is forecasted to grow at a considerable rate by 2024. Titanium renders good biocompatibility and is regarded as high standard for the treatment of edentulism. Such benefits will increase the demand for titanium dental implants over the forecast period. Dental clinics end-use segment should witness rapid growth at 5.5% CAGR owing to sophisticated healthcare infrastructure and better spending capacity of the population in North America. Availability of reimbursement policies and insurance coverage in certain dental clinics will lead to greater adoption of implant dentistry. 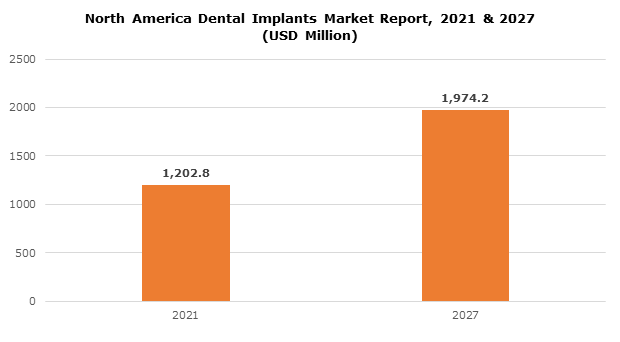 U.S. dental implants market recorded USD 1,159.1 million in 2017. High market size is attributable to rising acceptance of cosmetic dentistry, high disposable income and technological advancements of dental implants in U.S. Usage of 3 dimensional imaging with the help of Cone Beam Computed Tomography (CBCT) enables the dentist to better visualize of dental cavity. This results into enhanced screening and placement of the implant leading to increased adoption by patients in the country. Some of the major industry players in North America dental implants market are Dentsply Sirona, Danaher Corporation, Institut Straumann AG, Zimmer-Biomet and Henry Schein. Prominent firms are concentrating on innovative product launch to grab high market foothold. For instance, in August 2016, Zimmer Biomet introduced TSVM MP-1 HA and TSVT dental implants, that is an extension of tapered screw-vet implant family that helped the company in capturing more profits and expansion of customer base. Dental implants have been in use from several decades including Titanium implants that are being used since 1970s. Dental implants have emerged to offer customized implants as per the patient requirements. In addition, technological advancements have driven dental implants market, that involve usage of CAD/CAM technology and CBCT technology for improved imaging of the oral cavity. Technological advancements coupled with increasing dental patient pool will stimulate industry growth over the forecast timeframe.